Handguns are the weapon of opportunity. Not as powerful as a long gun, they are portable and may be carried with us at all times. The handgun demands plenty of practice to master. The rub is that handguns kick a lot in some calibers and in lightweight handguns. Until the laws of physics are changed this is a reality. It is also a reality that the more powerful cartridges have greater wound potential and are more likely to stop a felonious assault with a minimum of well-placed shots. 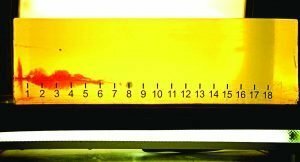 By reducing bullet weight, Hornady has managed to produce a load with modest recoil. Some of the more popular defensive handguns, including the snub nose .38 and the compact 9mm, have more recoil than some are willing to master. Others such as the .357 Magnum are a bear to fire in lightweight handguns. Load selection is critical. 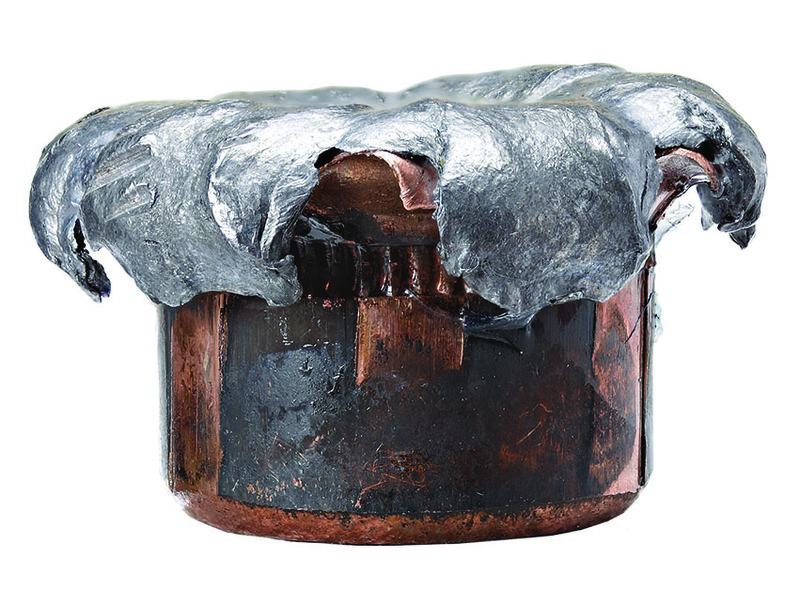 A heavy bullet load at +P pressure isn’t a good choice for a lightweight handgun. Rather a functional load with decent ballistics is best. The single most important component of stopping power is shot placement. The single most important cornerstone of combat ability is to be able to control the handgun. There are calibers I do not enjoy firing. I have been at this a long time and I avoid the heavy kickers except when necessary. I make a smart choice and shoot straight. The means of achieving low recoil varies. Some loads use the same projectile but a smaller powder charge. Others achieve high velocity by using a lighter bullet that generates lower felt recoil. A high velocity service load often uses a bonded core bullet to achieve penetration. 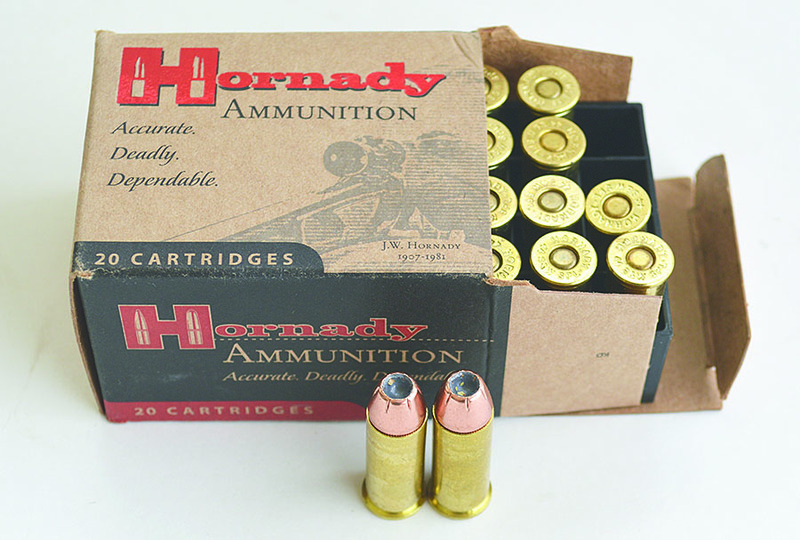 Despite the light bullet weight Hornady Lite bullets exhibit good penetration. A fast expanding bullet is fine for personal defense and doesn’t have to be driven as fast. Hornady achieves good results with their Lite loads by reducing bullet weight but maintaining good velocity. The .38 Special and 9mm Luger Lite loads are reliable, accurate and offer good expansion. Different size and weight handguns will behave differently with the same load. The aluminum frame .38, top, offers harsh recoil with many loads. The steel frame .38, center, is heavier and easier to control. The four inch barrel steel frame revolver, bottom, is the easiest of all to fire and use with the same .38 Special ammunition. These low recoil loads do not offer the balance of expansion and penetration of +P loads designed for service use. Their range of penetration is adequate but they may not be effective against vehicle glass and light cover. Against lightly clad threats they will deliver superior wound ballistics. 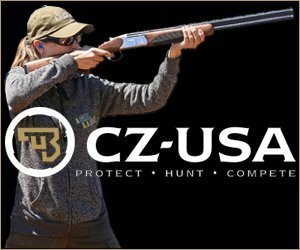 Other makers such as Black Hills Ammunition achieve good results in a different manner. Be certain of your needs and consider the likely threat. 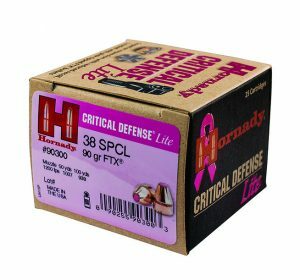 The Hornady Lite uses a 100-grain bullet with a pink tip. It is a Critical Defense bullet loaded to over 1,000 fps and especially designed to expand at modest velocity. I have gauged performance in my Honor Defense Honor Guard handgun and find it good. A load that I am enthusiastic concerning might be considered for full size handguns. The Black Hills Ammunition 115-grain EXP or Extra Power load is loaded as fast as possible without getting into +P territory. The 115-grain EXP clocks 1233 fps from the Glock 17. This is faster than any standard pressure 115-grain load I am aware of but just behind the +P loads. Wound ballistics are good without going to the harder kicker +P which may also produce more wear on the handgun. Black Hills Ammunition non-expanding Honey Badger loads offer excellent all-around performance without heavy recoil. Another interesting choice is the Black Hills Ammunition 125-grain Honey Badger. A non-expanding bullet at 970 to 1000 fps in most handguns, the Honey Badger relies upon a cutting mechanism for wound potential. I find it accurate and controllable in any handgun. Like the 9mm, 147-grain subsonic, this load may not work as well in handguns with heavy recoil springs. The load works perfectly in my SIG P250 and also the Honor Guard FIST. 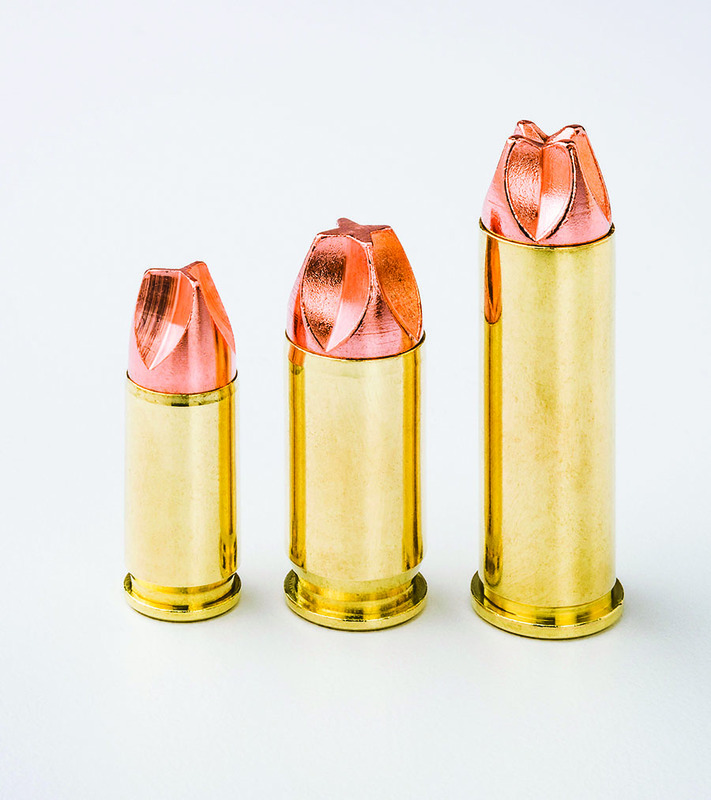 The .357 SIG is a powerful cartridge. I would not consider this cartridge in a compact pistol. For a mid-size handgun such as the Springfield XD this is an acceptable caliber. 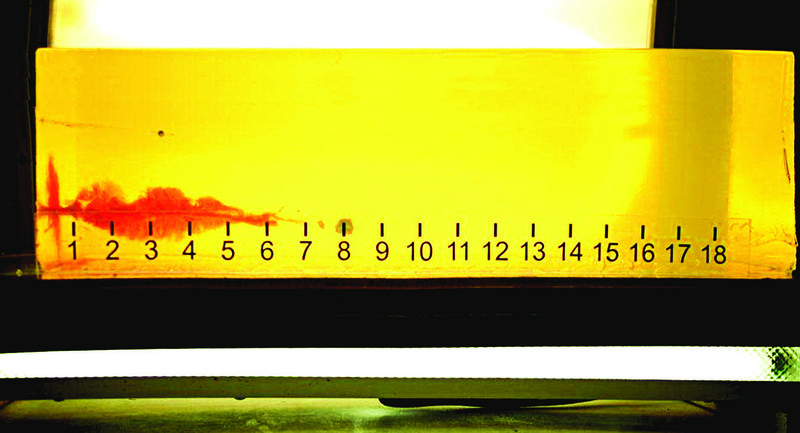 Most loads jolt a 125-grain bullet to 1350 fps; some of the 115-grain loads are at 1500 fps. This is a difficult cartridge to master. A light load that also offers excellent wound ballistics is the Hornady Critical Defense 115-grain load. Sensibly downloaded, the Critical Defense sails over the Competition Electronics chronograph at 1203 fps. No hotter than a warm 9mm this load offers good control. As an example the full power .357 SIG Hornady 147-grain XTP breaks 1200 fps- ideal for service use. The .38 Special is a mild cartridge in a four-inch barrel revolver with steel frame. Load a .38 +P in an aluminum frame two-inch barrel handgun and recoil is brutal. Good grips are an aid, but snub nose. geometry being what it is there is a tendency of the cylinder release to put a bloody notch in the knuckle of the thumb. Hornady offers the Hornady Lite 90-grain .38 Special low recoil low. While light weight sometimes means under penetration, this isn’t the case with the Critical Defense bullet. The .357 Magnum revolver has a well-earned reputation as the most effective handgun caliber ever deployed. The Magnum is a great stopper but it also exhibits a great deal of muzzle blast and recoil. It is a daunting proposition to master the revolver without extensive training. The rub is prolonged firing with full power loads is also hard on the small parts of the revolver. An alternative is to deploy the most powerful .38 Special loads, which work well and function in the Magnum cylinder. The Hornady Critical Defense 110-grain load is one choice. Another is the Black Hills Ammunition 125-grain JHP +P. In the .357 Magnum we have the Hornady Critical Defense 125-grain load at 1380 fps from the four-inch barrel revolver. While an intensive practice program is needed to control this handgun and load it isn’t as harsh as some of the loads that break 1400 to 1450 fps in .357 Magnum. I would avoid lightweight aluminum frame compact Magnum revolvers for personal defense. 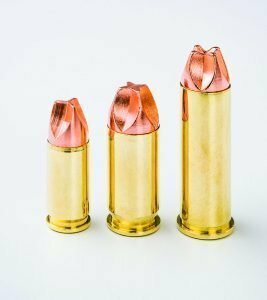 The Black Hills Ammunition 140-grain TAC loading using the Barnes all copper hollowpoint seems to be the best combination of low recoil and effect among what is usually a hard kicking set of loads for the .40 S&W. The Hornady XTP is a good choice in .44 Special. 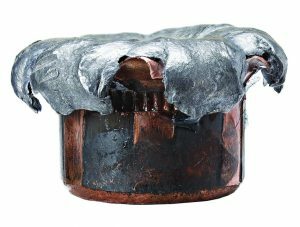 Modest operating pressures for the .44 Special and the presence of the lightweight Charter Arms Bulldog means that the ammunition companies must load this cartridge light. 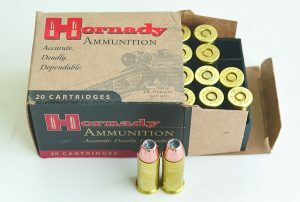 Hornady 165-grain Critical Defense loading offers good expansion and lower recoil as a result of a lighter weight bullet. At over 900 fps this load offers good expansion. A full weight load is the SIG Sauer 240-grain JHP at about 750 fps. This load is mild and controllable and suitable for use in the lightweight five-shot .44 Special revolvers. These loads offer less recoil in a steel frame .44 Special revolver than most .38 Special +P loads in the .38 revolver by comparison. Those needing more power should look to the .44 Magnum. The .44 Special is a mild shooting big bore cartridge with good properties for personal defense. Recently a student showed up with two inherited revolvers. One was a four-inch barrel .38 and the other a 1970s Model 29 .44 Magnum with a four-inch barrel. She was leery of firing the .44 Magnum. I supplied a box of 210-grain Black Hills Ammunition “cowboy loads” and we tried out the Model 29. It recoiled less than the .38 Special and was more comfortable, accurate, and easier to use well with these 750 fps loads. The .44 Special loads mentioned are ideal for personal defense use with this powerful hunting handgun. The heavy barrel really dampens recoil. In the .45 ACP a certain balance must be maintained to ensure that the firearm functions. A self-loading handgun requires a certain amount of recoil force. +P loads are not needed in the .45 ACP. Even a lightweight hollow point may exhibit a good balance of penetration and expansion with the .45 ACP. The Hornady Critical Defense 185-grain load, the Hornady 185-grain XTP or the Black Hills Ammunition 185-grain JHP are all good choices with good wound ballistics. The .45 Colt offers excellent wound ballistics. Among my favorite calibers is the .45 Colt. I prefer the .45 Colt to the .44 Special and even the .44 Magnum revolver cartridges. Even the cowboy action loads, which are loaded light for good control and for economy, are fine for home defense. A 250-grain .45 caliber bullet at 750 fps is a huge chunk of lead for a handgun bullet. The Black Hills Ammunition cowboy load is easily controlled and accurate. If you are familiar with the handling of your cowboy action revolver there is no reason you cannot count on it for home defense. An expanding bullet load that outstrips the .44 Special in wound ballistics is available from Hornady. 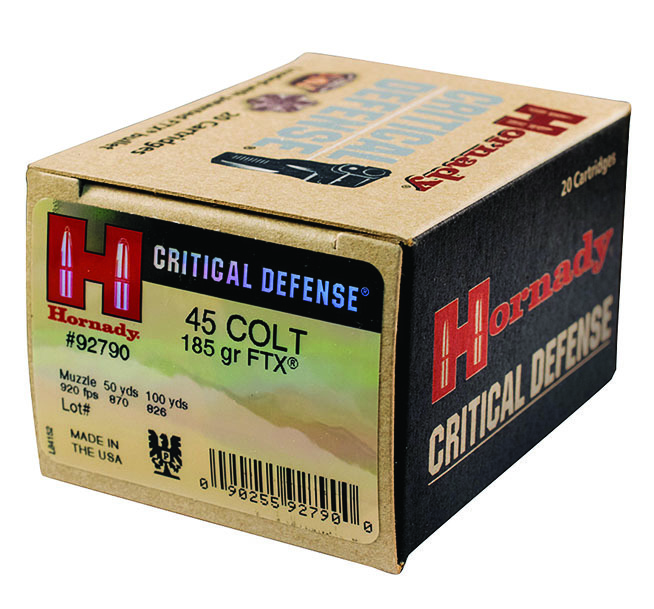 When I use the .45 Colt for home defense, the Hornady 185-grain Critical Defense is a first choice. This load offers impressive wound ballistics and excellent accuracy. These loads allow the use of handguns that may have seemed too painful or hard kicking to fire with good control. Yet, they offer good wound ballistics and predicted effect. Make a wise choice and concentrate on accuracy and control.